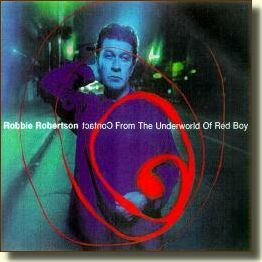 Throughout his solo career, Robbie Robertson has been as fascinated with sonics as he was with songwriting, so perhaps it wasn't entirely surprising that he collaborated with techno DJ/producer Howie B and remixer Marius de Vries on his fourth album, Contact from the Underworld of Redboy. Anyone familiar with his moody, atmospheric solo efforts will realize that there's a bigger jump between Music from Big Pink and Robbie Robertson than there is between the Daniel Lanois-produced Robbie Robertson and the ambient-flavored Contact, but the electronic textures and dance beats still may come as a shock to some. The electronics are interwoven with blues, folk, country and rock, as well as American Indian music. And, as on Music for the Native Americans, Robertson is primarily concerned with American Indians throughout Contact, whether it's through the chants of "Peyote Healing" or the protest of "Sacrifice," which features Leornard Peltier -- a Native American who has been imprisoned since 1976 on charges of murder many believe are fabricated -- on a telephone call. Both his lyrical and musical concerns can get bogged down in their own pretensions, but often, the results are provocative and unique. 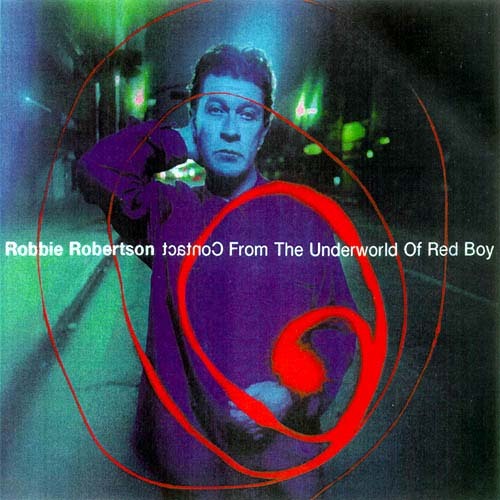 Robbie's follow-up to the 1994 album Music for the Native Americans, was originally scheduled for release in November '97 as Native Americans II, and was finally released in March '98 under the title Contact from the Underworld of Red Boy. Howie B, best known for his work on U2's Pop, and Marius de Vries, the genius behind the 1996 Romeo & Juliet soundtrack, appear on the album, as do Nellee Hooper (U2) and Tim Simenon (Bomb the Bass). At Capitol's Robbie Robertson page you'll find more information about Contact.... See also the Salon Magazine review and the February '98 article from SonicNews about Robbie and this album. The Japanese release of Contact ... contains the bonus tracks "Holy Hell" (a song very reminiscent of "Ghost Dance" from the Red Road Ensemble CD), "Pray", and "Making A Noise (Midnight Special)", see the insert of the Japanese CD (69K GIF). Early Canadian copies of Contact ... came with a bonus promo CD with the songs "Weeding", "Making A Noise (Midnight Special)", and "Outskirts (Buttermix)." The song "Take Your Partner by the Hand" was co-written by Howie B and Robbie Robertson and features on both Howie B's Turn the Dark Off and on this album. Several remixes of this song was also released on two CD singles in 1998.